11/5/2013: Aunt Alma died this morning. She was a brilliant woman and a bright light. I am so glad Zuri and I were blessed to spend some time with her in February. Rest in peace, Aunt Alma. Yours was a life well lived. This afternoon First Lady Michelle Obama will give the Commencement address at Spelman College. Anybody who talks to me for more than five minutes (OK, two minutes) knows that my daughter, Zuri, goes to Spelman. And if you talk to me for 10 minutes you will hear the story of why, among many of the good decisions she has made in her life, Spelman has so far been one of the best. But Zuri is not the first member of our extended family to go to Spelman. There is Andrea Williams, MD; Gabrielle Fouché Williams, and Janelle Duckett, who with Zuri is a member of the Class of 2012. And then there is my Aunt Alma Stone Williams. Aunt Alma entered Spelman at the age of 15. She was valedictorian when she graduated in 1940. She wrote a lovely letter to me with memories of my mom, who was her late husband Russell’s favorite cousin. I’ll share that letter with you in an upcoming post. 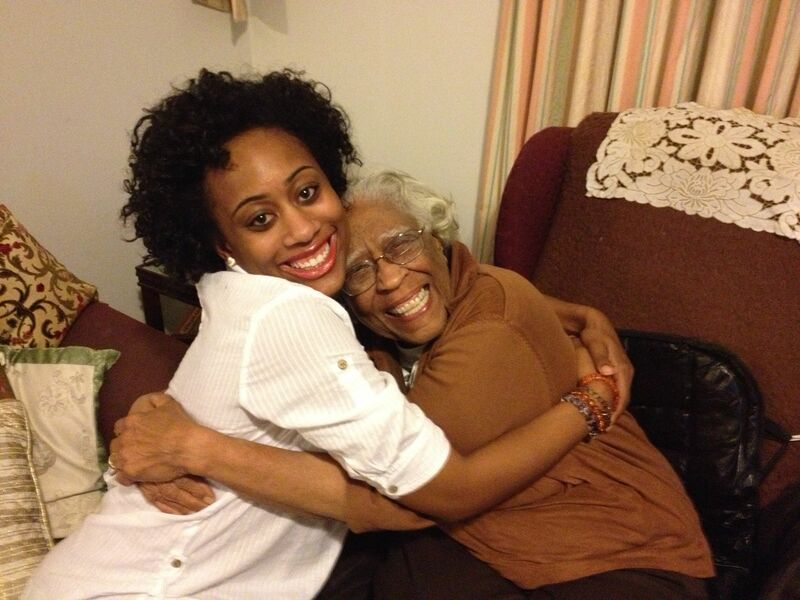 After earning her bachelor’s degree at Spelman, Aunt Alma earned master’s degree at Atlanta University. An accomplished pianist, she planned to study at Juilliard during the summer of 1944 when an opportunity arose that was so compelling she could not pass it up. She was invited to be the first ever and only black student at Black Mountain College, an experimental, liberal arts college in North Carolina. Though the school was founded in 1933 on the principles of democratic governance and community living, it had no black students or faculty for the first decade of its existence. School officials wanted to integrate, but weren’t sure how. In 1944 they decided to admit Aunt Alma as a summer student. “In attending Black Mountain for their Summer Session in 1944, Alma became possibly the first Black student in the 20th century to attend a predominantly white college in the South. (Most other white colleges did not integrate until twenty years or more later),” her son Russell wrote in a chronology in honor of his mother’s 90th birthday April 26. Aunt Alma’s decision to take that leap of faith changed Black Mountain College. “In 1945 the College admitted two African American students to the Summer Session and also two guest faculty members, performers Carol Brice and Roland Hayes,” the Urban News article said. “That fall the college hired an African American faculty member, Dr. Percy H. Baker, and admitted an African American, Sylvesta Martin, as a full-time student for the regular academic year. In the winter of 1947, five black students were enrolled at the college: two men, both veterans of WWII, and three women. That is exactly what Aunt Alma did. Congratulations to the Spelman Class of 2011. I’m sure anything I say will pale in comparison to what you hear from First Lady Sister Michelle. So I will let Aunt Alma’s legacy speak for itself. In the scholarship on your aunt, I have not found information as to what she did after attending Black Mountain College nor is there readily available public information as to how she might have felt on a personal level being a minority in that situation. I know she is listed as being on the Advisory Board of BMC and has spoken quite favorably about their progressive stance in relation to where the rest of the country was at in terms of integration. Nonetheless, I’m very interested in what sort of interview or oral history project might produce in speaking to pioneering women such as your aunt on the issue of social acceptance. As you are well aware, your aunt is living history and I am very interested in preserving her story for future scholars who may be focusing more on the connection between race and the arts in addition to the legacy of the artistic avant-garde which dominates current scholarship on Black Mountain College. I came across your post in doing research on Black Mountain College, and your aunt Alma Stone Williams. I am particularly interested in the race relations present at the time, and would be very grateful for any information on contacting your aunt. You are a great writer. In reading your well thought-out post, I feel better educated about some of our US History that wasn’t elaborated on during high school. With 2 daughters of my own, I can only hope they learn from the good decisions of others, such as Zuri. I can tell that you are one proud mama, as well you should be! Thank you so much, Jennie. I am learning so much. Being a mom has been such a glorious journey. I am really proud of Zuri and I feel really lucky. Savor every day, even the challenging ones. Your posts are a wonderful treasure trove of historical information. Thanks so much for sharing. I can’t tell you how much I’m learning. Henrietta, Thank you so much for the encouragement.